Countries by carbon dioxide emissions in thousands of tonnes per annum, via the burning of fossil fuels (blue the highest and green the lowest). CO₂ emissions per capita, 2016 (Our World In Data). 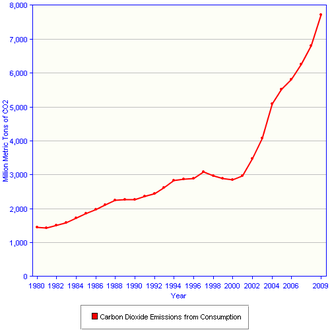 2 emission in millions of tonnes from 1980 to 2009. 2 than any other country. Other powerful, more potent greenhouse gases, including methane, are not included in this data. ^ Schrooten, L; De Vlieger, Ina; Int Panis, Luc; Styns, R. Torfs, K; Torfs, R (2008). "Inventory and forecasting of maritime emissions in the Belgian sea territory, an activity based emission model". Atmospheric Environment. 42: 667–676. doi:10.1016/j.atmosenv.2007.09.071. ^ "China's Emissions: More Than U.S. Plus Europe, and Still Rising". New York Times. 25 January 2018. ^ "Chinese coal fuels rise in global carbon emissions". The Times. 14 November 2017. ^ "Yes, The U.S. Leads All Countries In Reducing Carbon Emissions". Forbes. 24 October 2017. ^ "World carbon dioxide emissions data by country: China speeds ahead of the rest". The Guardian. 31 January 2011. ^ "Fossil CO2 emissions of all world countries - 2018 Report". Publications Office of the European Union. Retrieved 10 March 2019. ^ "Definitions & Technical notes". United Nations Statistics Division. Retrieved 10 March 2019.